What is the history of the human soul? What is its future? And what is our individual role within the collective whole, particularly in today's world of unprecedented change? Scientists have mapped the human genome, but they have not discovered DNA's spiritual equivalent, the embedded coding that shapes what we value and why we think and act as we do. 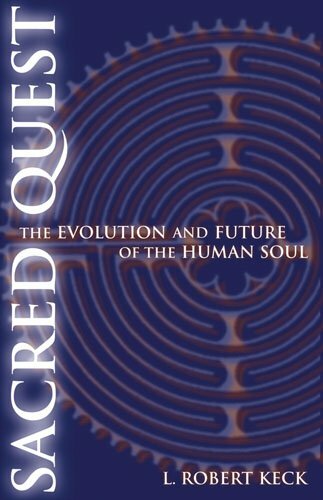 Now, in Sacred Quest, L. Robert Keck frames a compelling science of a collective soul that investigates the deep causal values determining why certain beliefs and behaviors become culturally dominant. This collective soul, like a butterfly, undergoes transformative stages. Keck explores three distinct phases in the soul's evolution. Epoch I, from 35,000 years ago to 10,000 years ago, corresponds to spiritual "childhood" and is marked by unity with nature, nonviolence, and reverence for the feminine. Epoch II, from 10,000 years ago to the present is the soul's "adolescence," an era of patriarchy, hierarchical control, and violence. We live in the "chrysalis" stage of change to Epoch III, our spiritual adulthood, in which the ego will yield to the heart. Current revolutionary transformations reflect the death of humanity's outworn adolescent values and the birthing of new, adult ones. Sacred Quest is not just a theoretical construct, but is a call for the engagement of one's whole life. Keck shares his own personal struggles to embody the emergent values of Epoch III -- reconnection to nature, democratization of power, respect for diversity and inclusivity, and the expansion of self, to name a few. Dr. Keck. . . perceives and clearly shares the deep structures of our spiritual development as a species on this planet. What Teilhard de Chardin pointed to, Dr. Keck fleshes out. Readers of Sacred Quest cannot help but. . . desire in their own lives to further this momentous evolution. (Rabbi Zelman M. Schachter-Shalomi, Naropa University). Dr. Keck's new book is an impressive overview of humanity's changing values and spiritual evolution. He provides us with an exceptional and comprehensive guidebook, showing us where we've been, where we are, and where we're going spiritually. This is a most compelling and thought-provoking book. (Angeles Arrien, Cultural Anthropologist, Author of The Fourfold Way). This book contains great wisdom. (Larry Dossey, M.D., Author of Reinventing Medicine). Keck makes it possible to look to the future with an urgently needed hope that it will express a new maturity. (John B. Cobb, Jr., Claremont School of Theology). Sacred Quest is not just a theoretical construct, but is a call for the engagement of one's whole life. Keck shares his own personal struggles to embody the emergent values of Epoch III-reconnection to nature, democratization of power, respect for diversity and inclusivity, and the expansion of self, to name a few. The book's "questions for those on a quest" are designed to catalyze the reader's personal transformation by probing the meaning of her or his connections to others, to nature, and to the Divine.